Reynard aux Chatillon delivers a gryphon foal the morning Lucia Camoreux comes to visit. It comes out squealing, eyes shut and wings folded, sticky with placenta. Within an hour its wings open, beating softly, as it stands to take food from its mother’s beak. Reynard sees Lucia as he returns from leading the foal and mare into a paddock isolated from the pasture. The mare cannot be kept from flying, of course, but she will return to the smaller enclosure as long as her flightless child is there. She will lick its wings so she can always pick it out of the herd. In twenty-eight hours, she will boost it into the air for its first flight. “Why do you separate them?” Lucia leans on the fence, wearing riding pants and a long coat of faded scarlet. Reynard touches his hat. He surveys the dale in which his paddocks sit, a flat place surrounded by hills that support thin lines of elm trees. A few storage sheds sit around the fences, and the long stable takes up one whole side of the valley. The gryphons in flight taunt the ones on the ground, then they switch places, a game that will continue all day with different players. The breeze is crisp. The whole pasture smells heavily of manure, but it is a kind, green scent Reynard has never minded. A hinge creaks far off. From the stable, his daughter Aveline emerges, her hands soiled and her long black hair tightly restrained. Seeing Lucia, she quickens her stride toward them. “What did you have her doing?” Lucia asks. Reynard’s thoughts stumble over an unexpected open pit. Without taking his eyes from the foal, he can tell Lucia regrets her words already, and is unaccustomed to the feeling. “Did you have something to tell me?” he asks. Reynard and Aveline do not live on the surface, which is for farms and gryphons. Locksgrove, the city, comes alive in the tunnels and on the cliff face. Reynard has met L’Escalier, the leader of the slave revolt, many times, but in taverns and manor offices—never here, never in his place. Working every day with temperamental stallions, Reynard is well-suited to notice signs of hidden discomfort, like the clear skies that often precede storms. Lucia has taught him revolutionary scholars are not all that different from gryphons. Something is about to happen. He waits for her to tell him what. So be it. Locksgrove won its last war working with far less. Both Reynard and Lucia startle as if caught in a tryst. Aveline, wiping her hands on a rag, smiles at their visitor. Aveline aux Chatillon could not respect a goddess more than she does Professor Lucia Camoreux. The conscience of the revolution, a walking library at L’Escalier’s side, and still gentle enough not to breathe a word of their secret meetings together. Aveline sees Lucia and Reynard standing in opposition—her skin like milky tea, his black as a gryphon’s eye—and rejoices at the sudden widening of her world. It is through knowing the Professor that she has made a decision: their pasture will do no business with Dominic L’Escalier. Sell the gryphons to farmers, to riders, to people who will care for them. Not to soldiers. Lucia has written a book called Treatise on the Failure of Revolutions that Aveline is making her way through one sentence at a time. Both women hope the new Senate will take it as scripture. Previous idealistic upheavals have gone sour because their leaders became seduced into too many evils they believed were necessities. Lucia has taught Aveline that L’Escalier, without sound advice, is a prime candidate for such seduction. Though Aveline agrees, she admits to herself that her motives are more basic: she fears for the safety of her grphons. Last year, when Dameciel injured his wing on a windmill, she slept in the stable beside him, unable to leave for fear the infection would spread. She saw the torn, blood-spattered skin whenever she closed her eyes. Aveline is no general. No waster of life. Her father will object to her decision, of course. There never was a more loyal soldier of the revolution: Reynard tended mounts for L’Escalier when the revolt was still confined to back alleys and outskirt farms. But Aveline believes the best way to celebrate freedom is to exercise it occasionally. Dominic L’Escalier wields power like a fiddler wields his bow, but her family won a war so they wouldn’t have to be anybody’s slaves. That goes for gryphons just as well as humans. When Lucia tells her who is coming, Aveline gives only a tight nod. Her father does not notice anyway: he’s watching his foal again before Aveline can get a sentence out. Lucia smiles, asks if Aveline has managed to get out to see friends lately, but it has the ring of distraction. At the sound of cart wheels rolling up the dirt track, they both break off. And at the sound of a roar coming from the pasture, even her father looks up. The roar freezes Reynard to his core. The herd is not at rest. They circle, like lightning in storm clouds. Ouragan. Of the three stallions, this is the only one Reynard could never acclimate to the side pasture. When a creature can fly, it becomes far more dangerous for it not to know its place. Dominic L’Escalier is standing at the outer fence, chatting with his bodyguards. Ouragan is circling, leaping to the air then strutting over the ground, around an arc that centers on the Sovereign Minister. Ouragan is sire to the foal birthed that morning. He’s picked fights before. Foudre, never the strongest male, bears a strip of discolored fur from where Ouragan slashed his haunch with a hatchet-sized foreclaw. Ouragan tightens his circle around the fence, bellowing and shaking his mane. Three gryphons take flight all at once, all skittish yearlings. They wheel in the air as others follow them up, an ever-widening helix of dark shapes against the clouds. Reynard throws the side gate open and strides into the pasture as it swings shut behind him. Man and beast are alone now, enclosed together. Ouragan veers to meet him. Reynard keeps his eyes downcast, his movements slight. Fortunately, it is overcast, so there is no danger of a shadow spooking the gryphon. “Reynard,” calls Dominic L’Escalier. His voice is cautious, and a little excited. A roar hits Reynard’s ears. He rolls across the pasture grass. Hooves thunder by him. A wing-tip feather grazes his face, tickling. Ouragan is charging the fence again. L’Escalier’s towering guards close ranks in front of him, but they needn’t bother—the stallion halts once more to face Reynard as he rises. Under the rage is a bond of trust Reynard can use. He foaled this beast, after all. He makes it to his knees. Then he points down the road, points hard, so L’Escalier can see. To speak a warning would be too much loud noise, too fast. The Sovereign Minister of Locksgrove swivels his head to look where Reynard is pointing. Reynard resists the urge to slap his own forehead. L’Escalier is only brilliant in two or three ways. Ouragan snarls. His mouth froths. Reynard points to L’Escalier, then again down the road, as softly as he can, as hard as he must. At last the Minister gets it. He draws his guards by the shoulder down the road and out of sight. His smile is calculated. After smiling he yawns, as though he is at tea, and not much interested in it. Boredom will put the gryphon at ease. Time to move in. Sifting his feet through the grass, his loose shirt stained with dew, Reynard approaches the wild-eyed stallion. Ouragan roars. Reynard stands firm, though ancient instinct screams at him to run. A sudden movement now, too close to dodge, would mean death. Two more steps. One. Arms-length away, Reynard stretches out his hand to Ouragan’s mane, stroking with his fingertips. Grooming. A new roar dies in the gryphon’s throat. He pants. Reynard feels the hot breath. On the far side of the pasture, a few of the circling colts gain the courage to land. Reynard’s hands shake as he places them on either side of Ouragan’s mane. His father showed him this—had his father trembled as much? Fool, he thinks, the hard part is past. Now it’s all rhythm. He breathes, in and out, seeking the pulse of Ouragan’s life. Their breaths synchronize. His throat rumbles, but he steps forward to nuzzle Reynard. Reynard, at the same time, looks up. Lucia stands just outside the fence, while Aveline has crept into the pasture, wielding the stout sharpened pole Reynard keeps behind the shed. Their last resort. Reynard is glad Dominic L’Escalier has not yet asked why his mere presence frightens gryphons. He probably doesn’t care. Lucia once confided in Reynard that the Minister cultivates unfamiliarity as a habit, to divert his enemies. The unfamiliar disconcerts animals. Aveline catches her father’s eye with a firm message he cannot read. She is still carrying the pike as she leads the group of six—herself, Reynard, Lucia, L’Escalier, and the two bodyguards. Inside the fence the gryphons have settled, and now the only thing in the sky is the sun, promising a radiant summer evening. They take the Sovereign Minister all around the pasture, Reynard showing him how the operation is getting on. L’Escalier nods at all the right times, sometimes conferring with Lucia on things she seems to have mentioned to him before—”Is that the famous Foudre?” or “You were right, that shed looks fit to blow away.” He is taken with the new foal, who is sharpening his claws with the enthusiasm of all nature’s new children. Aveline is gripping the pike hard enough to snap it. She follows without being asked. At the cart—pulled by a small mammoth of the type never allowed outside the city—L’Escalier motions his two bodyguards aboard with the driver, then turns back to the group. “How many adults do you own, Reynard?” he asks. “Why do you want to geld our stallions?” Aveline repeats. L’Escalier waves it off. But in the split second beforehand, Reynard sees something raw and hot flood his daughter’s features. The mammoth grunts as Lucia joins L’Escalier by the cart. Reynard suddenly understands the nature of the meeting she cut short to come warn him. “Does this mean Locksgrove has formed an alliance with Lascony?” she asks. Does she think I don’t know? No matter how many he sells to private buyers, simply knowing Lucia reminds Reynard daily that a fledgling nation of former slaves cannot afford luxuries like unfettered commerce. He sought out Dominic L’Escalier’s cause in his life’s one moment of white-hot rage, watched the one-time manor slave drill barely-armed troops and quote philosophers in his speeches, and has known ever since: the Minister is the father of freedom. There can be no repaying a debt to him. And war? asks Aveline in his head. Is war not a luxury? It is not a choice. They have never been his gryphons. They have always been Locksgrove’s. L’Escalier’s. The upper tunnels, unlike the tide-washed slums at the cliff base, are clean, and well lit by skylights that allow shrubs to grow. Other than the mammoth traffic, this neighborhood—reserved by L’Escalier for government employees—is quiet. Smoke from a fire, scented with cinnamon, drifts along the tunnel, wide enough for three mammoths abreast. The beasts prefer it down here, out of the sun, where their shaggy coats don’t make them sweat. Aveline skirts around one. She’s been keeping ahead of Reynard all the way home. She pushes through a red curtain into their main chamber without holding it open. Reynard walks into it. No matter how many times L’Escalier offers him a palace on the cliff face, Reynard doesn’t want to move. He and Aveline each have their own room, and the kitchen is in a third, all separated from the main chamber by their own curtains. Aveline is brushing hers aside when Reynard enters. He calls her name. She sighs and turns around. The large dining table sits between them. A heavy hand clutches Reynard’s stomach. She does indeed look a great deal like her mother. It is as though she has slugged him in the gut. The wind whistles out of his lungs and he collapses into a hardwood chair. Aveline looks more appalled than angry—she may not have meant to say so much—but her features harden again. She disappears behind her bedroom curtain, and returns carrying a wax tablet, which she thrusts at Reynard. Handwriting runs across it in several rows. Of course, Reynard cannot understand it, but he can tell every other row was written by a practiced hand. Every second row is scratched more messily, though the writing tightens by the end. He recognizes the script of the odd-numbered rows. He has seen it on letters from the university, the ones he glances at before going in search of someone to read them to him. This is enough. So Aveline wants to hurt him. Very well. He is a strong man. He can hurt back. When Reynard gathers himself after this, he is sitting in one of the hardwood chairs, warmed by a fire he doesn’t recall starting. Aveline must be in her room, or out on the streets looking for one of her friends. He makes a pot of stew with fresh vegetables and broth, leaves a bowl out as a peace offering. It grows cold. Long after the skylight darkens, he notices he sat on the wax tablet with the writing lesson. He hauls himself up, joints snapping, to put it someplace out of the way. The foaling season passes. Aveline refuses to have anything to do with the adult gryphons, spends all her time exercising and grooming the yearlings. She cleans the stable, then cleans it again, and does everything she can to avoid her father. Once, she respected his willful determination to soldier forth on his own course no matter the consequences; now her old respect sickens her. When the appointed day comes, the mares and geldings are led through the paddock gates into waiting trailers whose cloth coverings are emblazoned with the blue boar of Lascony. Each gryphon folds its wings and munches at the oats left for it, while the Lascon drivers lock the rear gate. Even Ouragan goes quietly, though Reynard has to lead him in by hand. The trailers take them to the front lines, to the scraps of land Lascony and the Abelard League have been struggling over for longer than Reynard or L’Escalier have been alive. The gryphons fly over these provinces, bearing commanders who urge soldiers forward. The Lascons later use them as scouts. When things go bad, they become bombers. They are struck with arrows, rocks from slings, ballista bolts. 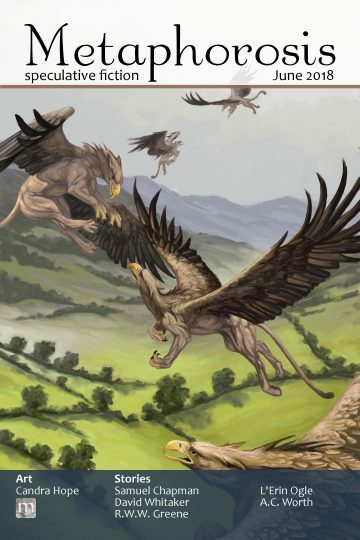 Many gryphons together can turn the tide of a battle, but the more who appear in the same sky, the more seem to die. One day at the beginning of autumn, more than half the remaining gryphons cross a churning river to plant a bridge for the Lascon army to cross. A hidden Abelard ambush force surges out of the underbrush before the Lascons can hammer the planks into place. They throw nets at the gryphons and stab them and their riders with pitchforks until long after they die. Trapped on the other side of the river, the other Lascons are crushed by the main Abelard force. Less than half escape. Ouragan, the fierce, throws his untrained rider and takes to the sky, but a crossbow fusillade shreds his wing and sends him crashing to the ground. He dies on impact, a last act of rebellion against the men awaiting the satisfaction of butchering him with scimitars. Two days after, the news reaches Locksgrove. Dominic L’Escalier walks out of a senate meeting, in the middle of a speech, and sends his steward to find Reynard aux Chatillon. Once again, Lucia arrives first, and finds Aveline, who, seeing the Professor hastily wiping mucus and tears from her face, knows instantly what has been lost. Reynard descends into a café on the cliff face, on the fifth level of a boardwalk that rises another six stories above their heads. Tables form a constellation on the wooden walkway before the shop, which is recessed into the stone. L’Escalier has already claimed a table, and ordered two overlarge mugs of coffee. The other tables are empty. “What is it you want?” Reynard asks, rubbing his eyes. The coffee smells dark and strong. Reynard stifles a yawn. Aveline still does her share of the work in the pasture—more, if anything—but speaks to him two and three words at a time, and not at all when the work is done. Since their fight, he has not slept well. Some giggling from below, maybe the crowd around a street performer. Someone wheels a cart along the next boardwalk up. So that’s what this is. Reynard’s eyes drift out to sea. The sky is steel-grey, the breakers on the ocean like cold white fingers. Autumn is roaring past. Dominic L’Escalier alienated Reynard’s daughter, enslaved the things he cared most about, to die in a war about which they understood even less than he does. Now the Minister wants to do it again. To gryphons even less prepared, who will die even faster. He could not have done any of these things had Reynard not consented. By the breaking of his chains, Reynard himself has been broken. Neither of his usual hulks materializes. The proprietor of the shop is stock-still with his hands in a vat of soapy water. Reynard’s fist connects with L’Escalier’s jaw. The Minister stumbles. He catches himself on the edge of another table and turns back to Reynard. Reynard digs his nails into his palm, and turns, caring only to put distance between himself and this man who burns everything he touches. A fisherman is rowing through the bay, headed for home. There is about to be rain. The eyes of the silent, waiting Minister drive Reynard into his own head, toward a fight with this question he has never before dared to meet. Clear as day, Reynard sees each of the gryphons he has raised since he inherited the paddock. Unfolding its wings for the first time. Scratching at grass and bark and the walls of the paddock while its mother guided it around. Taking flight for the first time, its roars joyful, like a human child running for the sake of running. Its muscles flowing like water, with no motion wasted. Carrying a commander out to the battlefield. Falling from the sky, punctured with pikes, life leaking out. Cursing Reynard aux Chatillon, with their last breaths, for delivering them life only to send them back into slavery to save his own skin from the same fate. Condemning him, in some strange gryphon language he would never speak, for his crime of delivering a human daughter into the praxis of suffering. He cannot unburden himself of his debt. Cannot decide for a whole city. Nor for Aveline. Aveline and Lucia leave the University campus at dusk. It is hard to tell the time, since few people in the low tunnels are bothering to maintain the light cycles anymore. They stay huddled in their caverns with their families, or flee to sea, crowding the bay with boats. Collisions have occurred. Aveline doesn’t know where they think they’re going. She herself is going to the empty pasture to take Lucia to shelter with Reynard—though she isn’t certain Reynard knows why people are hiding. During their lesson, Aveline had to tell Lucia how her father sits in the shack most days, staring at the wall. They still are not talking, but she has begun to bring her father tea, which he sometimes even drinks. Lucia can explain to him that the fall of Lascony took three days, and that Dominic L’Escalier has fled the city. None of it shocked Aveline, but to tell Reynard his one-time hero has abandoned Locksgrove will require Lucia’s gentler touch. Her father still wants desperately to believe the Sovereign Minister is good. A left, and a right. A few tunnels remain, and then they will be at the pasture. They’re close enough to the surface to tell it’s raining. Will they drag us all away from here? she thinks. Will all these tunnels will start leaking, with nobody to maintain the seals? Will the gryphons that are left go feral? Will they prefer it that way? Will they remember us? In the shack, with wind howling and rain dripping through the roof, Aveline asks Reynard and Lucia about slavery. Reynard is stuffing plaster into the cracks in the shed, blotting out a rain-washed view of the pasture with each one he closes. He wants to keep doing this for a while. There are some holes left. But then Aveline asks again in a small voice—”What is it going to be like?”—and Lucia can’t answer. His daughter needs him. It is the first time in a long time. Even before she turned against him, they were more like business partners than anything else. Lucia is sitting on a sack of oats. She has unbuckled and unsheathed a long, gently-curved sword, and placed it on the table. Aveline is on the floor in the corner, her knees drawn up around her long pike. Reynard drops into one of the chairs. The wind howls through the following silence. Amid the drumming of rain and the scent of wet wood, Reynard realizes they expect him to explain how she died. He will do it to fill the silence. “Slave or free?” Aveline asks. Now everyone falls quiet. Lucia grips the sword hilt. Reynard squeezes the wall putty in his hands, then, all of a sudden, drops it. There’s a pitchfork in a hay pile, ten paces away from the door. If he can reach it and return before any Abelard soldiers appear, he and Lucia might be able to bottleneck them in the shed door. He doesn’t know when he decided to fight, or to die. Perhaps it was the story, but more likely it was Aveline, who now gives him a look in response to his injunction. It is defiant, nakedly so, but not contemptuous. She does not mean to hurt him. She is like the wax tablet now, a simple statement of fact, telling him the way things are. And it’s all right. Just because she can protect herself, doesn’t mean he can’t protect her too. Lucia recalculates in her mind. The voice comes again, and Reynard strains to listen, but he can’t pick any one out of the wind. Reynard nods. There isn’t time for anything else. Lucia grips the edge of the door. Throws it open. He runs. The ground vanishes under his feet. The paddock is dark, but the Abelards are carrying a light that shines a demonic red over the fences and pasture. Reynard grabs the pitchfork out of the hay pile, and whirls around. Reynard freezes. An Abelard might know Lucia’s name. Maybe. But his? He hears a sword strike point-first into soil, then, right after, a fist hitting bone. Rushing with the pitchfork, he arrives in the pool of light at the same time as Aveline, who lodges her pike in the tines of his weapon so he cannot move it. Reynard turns from her to the man lying on the ground, who’s managed to hold onto the torch despite Lucia having knocked him flat. Just one of Dominic L’Escalier’s many talents. Reynard had thought this was done hurting him. But there is more still. “What do you mean?” he asks. Reynard is thinking of the foals in first flight, of the power of their wingbeats as he loses them in the sunrise. There is no creature in the world that knows so well where it’s going. Reynard drops the pitchfork with a thud. While Dominic is distracted, he takes the torch out of the Minister’s hand, then turns. Another weapon hits the dirt. Someone hurtles toward the shed. Reynard keeps walking. Once the tunnel city of Locksgrove is no longer underfoot, the pastureland turns to forest. The woods drip year-round with mist, the needles on the trees heavy with water, the soil slick with mud. There are just three roads. On one of these, Dominic met with the Abelard ambassadors. On the day the revolution began, fog made solid walls over all three. Aveline follows her father’s torch to the edge of the woods before she musters the will to call out to him. These trees have a threshold: the last farms clear-cut such a perfect line one can stand with a foot in and a foot out of the forest. He turns. It is light enough to see his face. He must have looked like you, she thinks. He stares at her. His surprise, Aveline thinks, must mirror her own. Didn’t she hate this man? Didn’t she rail every day against his weak will, his blind equation of L’Escalier to the whole city? Hadn’t he made war on the Abelards? No, she thinks. No. He didn’t. Reynard takes the coil of rope in his hand. In the next moment, a moment that lasts a long time, Aveline is grateful for the knowledge she has taken for herself. Not everyone knows the instant they have made a decision that will alter the rest of their life, but she does now. She will follow her father into the forest, into his understanding of beautiful doomed things. She will accept his skills, but she will also read and write, and in doing so, perhaps will save Locksgrove by saving the creatures it has made. The best of it. The best of her father. He slings the rope across his shoulders, and they step together into the shadows.